The blanket exercise is a teaching tool that will get you, for a time at least walking in someone else's shoes! Explore over 500 years of history with us as we share the historic and contemporary relationship between Indigenous and Non-Indigenous peoples in Canada! The blanket exercise is a far cry from the social studies taught to earlier generations of Canadians based on the notion that North America "began in 1942 when Christopher Columbus sailed the ocean blue." The exercise is an endeavor to learn the history from an Indigenous perspective. We spent an afternoon with 350 Saskatchewan Justice Ministry leaders in our province journeying alongside them through 500 years of Canadian History through an Indigenous lens. 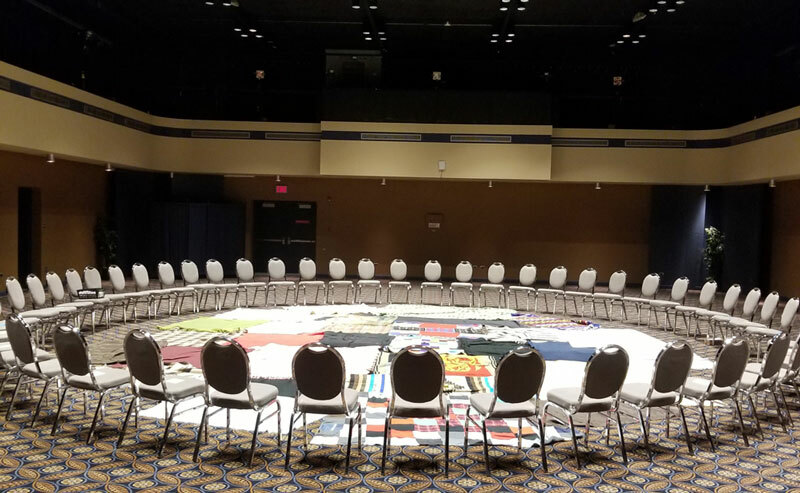 The blanket exercise was an experience of sharing and understanding the present complexities that we all reside in in this province and country. Thank you to all who attended for your attention, contributing voice, and your willingness to participate and observe.